I see this from time to time but only managed to snap it recently. 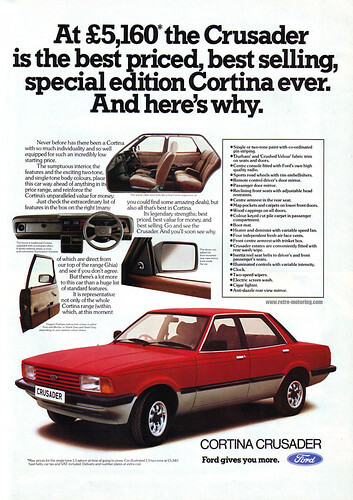 The Crusader was the end-of-line limited edition Cortina, based on the Mk5 that was launched two years earlier in 1980 (hence the official "Cortina 80" designation, although the press and everyone else referred to it as the Mark Five). It was built to shift the last remaining units before the arrival of the controversial Sierra. The Sierra didn't come a moment too soon - sales of the aged Cortina (the Mk5 was a rehash of the Mk4, which was mechanically similar to the Mk3 of 1970) were declining rapidly in the face of stiff competition from GM/Vauxhall/Opel with the new-in-81 FWD Cavalier/Ascona, particularly in the fleet market. They were a common sight on our roads in the 80s, the default choice of saloon for just about everybody. Nowadays they aren't common at all, and so it's a lot easier to appreciate the coke-bottle curves and neat proportions. Personally I'd love a Mk4 (they're a bit "cleaner", with neater bumpers and lamps) in a lurid 70s green or orange, on some subtle wheels and with 2.9 Scorpio Cosworth motivation. Retro Cars Magazine is no more. Future Publishing has announced that it is to cease publication of Retro Cars magazine with immediate effect. The current issue on sale will be the last and issue 43 will not be printed. Editor Paul Wager and Features Editor Richard Hammond will be leaving the company on Friday, November 17. Art Editor Mark Field will be moving to Windows Vista magazine. We would like to take the opportunity to thank everyone who has made the magazine such fun to work on over the past few years. We had produced a large part of issue 43 before the decision was taken and subject to management approval we hope to post the completed pages at www.retrocarsmag.co.uk in due course. Any announcement of this news which you may already have seen elsewhere yesterday will have been the result of my private email to contributors being posted to a forum. I loved it when it first came out. It really seemed to capture the spirit of a whole new scene, and the associated show at Santa Pod every year was a massive highlight for me. But over the last six months or so the mag started to go downhill - too many race cars, expensive/classic-rather-than-retro motors, factual blunders and shallow technical depth. The final nail in the coffin for me was an issue that featured the possible restarting of MGF manufacture under new Chinese ownership. I mean, sure it's an interesting story, but what's it doing taking up a third of the main news page in a retro-car magazine? Bizarre. So what happens now? We shall see. The forthcoming online Retro Driver magazine sounds incredibly promising, written and created by people with passion, knowledge and experience. And as for the show, well, there's a Retro-Rides show coming in August 2007. I'll be putting details on here when it's all a bit clearer. So far it sounds like it's going to be a hell of an event! Mystery Audi - any ideas? I've finally got round to putting up a gallery of pictures that I took a while ago. It was a perfect day for a retro-obsessive like me - perfect weather, fantastic roads, light traffic and the car was running sweetly. Whilst exploring an area on the Welsh borders that I haven't really been to before, I spotted a fantastic collection of motors rotting away at the front of a building at the side of the road. I turned round and headed back. Nobody seemed to be in, nobody nearby was around to tell me anything, but I snapped a few pics of the treasures. Click to see the gallery. There were some cracking cars there - a Mitsubishi Celeste, an Ambassador, a few first-generation Renault 5s. Quite a variety and range. Weird eh? I'd absolutely love to know the story behind it. The boot has been shortened (quite a good job done of it too from what I could see! ), bumpers from something else have been grafted on, and the front end has some sort of chopped grille and headlamp/indicator arrangement. The side panels are screwed on from a Renault 5 (perhaps one of the ones nearby) and the externally-mounted spare wheel is a bizarre and fascinating touch. I couldn't tell any clues from the badge on the front, I have no idea how it came to be or why. If anybody has any thoughts, input or ideas, please get in touch and share!